Paula Gallo, with Ingrid Linke, left, and Lynn Mervosh, is pictured preparing the flowers for the Governor’s Inauguration Ball in the Connecticut Convention Center on the morning of Inauguration Day, January 9. Being a floral designer is not all a bed of roses. Just ask sisters Tamara Pezzente and Paula Gallo, owners of Pentimento, a Suffield floral design company, who are regularly up before the crack of dawn to get to the 5 a.m. opening of the Boston flower exchange. The Suffield residents, who started the business about 30 years ago, have been catering to the rich, famous, and politically connected as well as every-day folks who appreciate their artistic touch and aesthetic. Their artistry and easygoing way, combined with their knowledge of all things that grow and an ability to translate a bride’s vision into memorable arrangements led them to be chosen a Best of the Knot (wedding publication) in 2016. Gallo, who loves her job, credits her sister with being “the artistic one” who started out doing the flowers for her church, but Gallo is likewise creative. She reports that they got their big break when, after submitting their artfully designed business cards to Victoria magazine in the mid 80’s, the cards were chosen to be published. The then manager of the exclusive Polytechnic Club (now ON20) in Hartford saw them and commissioned them for some jobs which led to their foot in the door of many corporate offices. She also reported that the Lamonts wanted to do things a little differently from previous inaugural balls which featured a sea of (225) 72” round tables where people sat and were served. They brought in a variety of 40 restaurants from across the state, as well as vineyards and breweries. Big ones, small ones, Thai, farm-to-table, etc. were all represented. There were also a variety of tables set up. There were high top standing cocktail tables, low 36” round tables, long skinny tables, high tables, wide tables, etc. Each restaurant had an 8’ table in front of and in back of a pillar with tall light-up boards to indicate where they were. Gallo thought that it gave the room a certain vibrancy and energy with people moving about to sample the food. 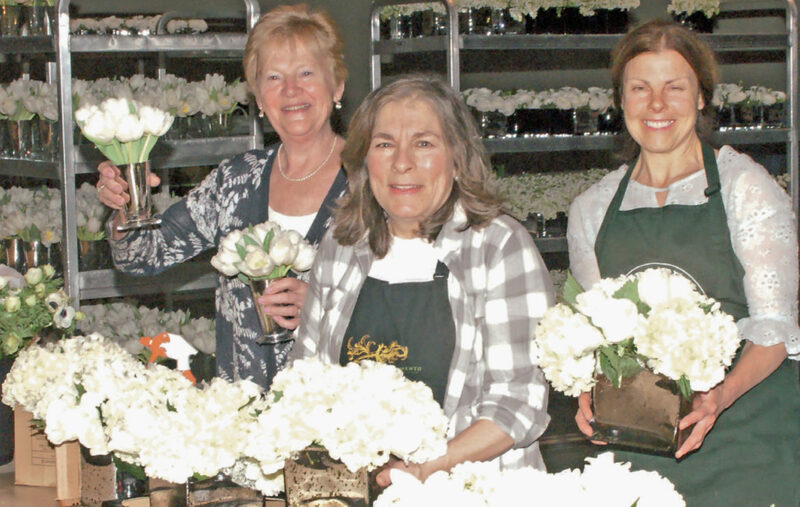 In addition to the frenzy of providing all the floral arrangements in a short period of time, the sisters were responsible for breaking down the floral decorations at the end of the ball since there was a 10,000-person volley ball tournament the next day at the Center. Their day that began so early did not end until 3 a.m. This was not the first inauguration for which Pentimento has supplied flowers, having done both of Governor Malloy’s. When asked how they managed to get these high-profile jobs, Gallo reported that they had done a fundraiser at the Wadsworth Atheneum many years ago and met a woman who was working for Senator Dodd’s presidential campaign. She asked them to do some flowers at the homes of fundraisers, and that started a steady stream of requests both individual and corporate. In addition, Pentimento has done flowers for some major fundraising benefits including the Wadsworth’s Fine Arts and Flowers and is participating in the upcoming, sold-out, Black and Red Ball hosted by Hartford Hospital. The Pentimento shop is located at 175 South Main St. in Suffield. While the hours are not regular, you might be lucky enough to be walking by when one of the women is working in the shop. If not, it is still interesting to peek in the window and see what garden delights are on display. The shop is expected to be opened more regularly around the Easter and Mother’s Day holidays and you can always schedule an appointment on the website www.pentimentoflowers.com.